Roaring out of the fiery furnace of the motor city music scene is “Hellfire,” the new album from Detroit blues guitarist and songwriter Kenny Parker. The eleven tracks feature Parker’s veteran band and his new collaboration with the legendary Jim McCarty and the debut of Dan Devins on vocals and harmonica. Parker and McCarty bring all their experience to bear on the collection of hard-driving blues rockers. You can hear the sweat and toil from the years Parker worked at a Cadillac factory while playing blues at night with top acts of the Detroit scene, Mr. Bo (Louis Bo Collins) and the Butler Twins. 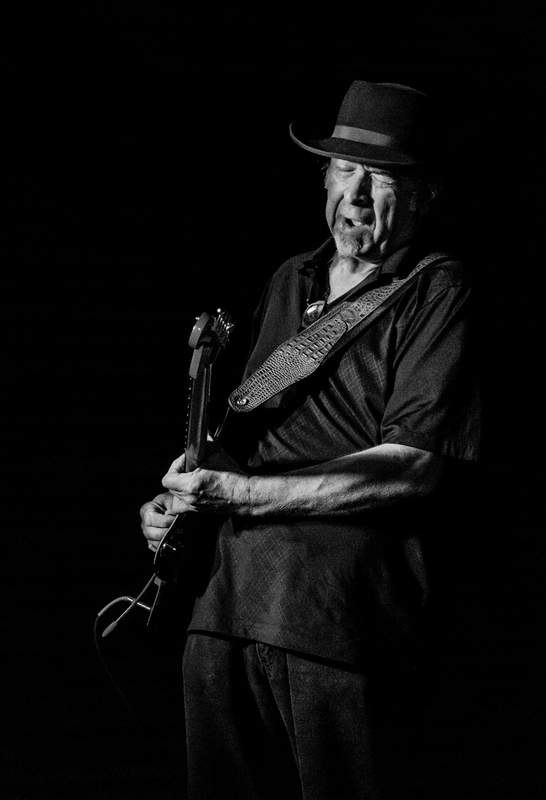 McCarty lends all the tricks of the trade he learned as guitarist for Mitch Ryder and the Detroit Wheels, the Buddy Miles Express, the super group Cactus and his own band Mystery Train. 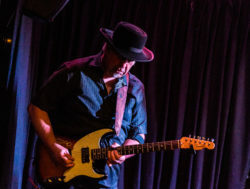 Since Parker doesn’t consider himself a singer – his guitar playing taking center stage – he brought in Dan Devins, whose charismatic, melodic and powerful singing voice and incendiary blues harp round out the front line of this muscular five piece. The provocative ‘I’ve Got My Eye On You’ opens the set with the tight rhythm section of Mike Marshall on bass and drummer Dave Marcaccio driving the four-on-the-floor shuffle hard and true while the guitars trade leads and Bill Heid adds some honky tonk piano, setting the blue print for the album. Some heavy organ bolsters the lead liner and vocal hook on the Stax-styled burning soul of ‘Baby Come Back To Me,’ a track with obvious Sam and Dave inspiration. The down and dirty bump and grind blues ‘Blind And Paralyzed’ is a classic “don’t-do-me-wrong” song with the guitars and blues harp nailing that hoochie coochie line. The old-time rock ‘n’ roller ‘Bye Bye Baby’ spotlights McCarty’s slide guitar skills and the swamp rocker title track, ‘Hellfire,’ is the sorry tale of red-haired Ruby, the kind of woman, who will break your heart with one look, and whose kiss could be the death of a good man. 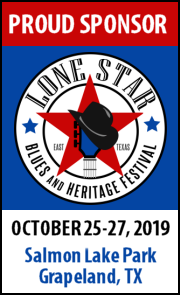 Devins steps out front on his harmonica to intro the rambling blues ‘Goin’ In Circles,’ pleading his case to “love me or leave me” and end his torment of unrequited love. The swinging jump blues ‘Dance With Me’ is a sure fired juke joint dance floor filler and radio ready good time. Devins wears his heart on his sleeve for the tear-jerking blues ballad ‘I’m Missing You,’ channeling the souls of Sam Cooke and Solomon Burke. The 60’s R&B party continues on the smooth grooving ‘But Then We Danced,’ and the jaunty romp ‘Half Crazy,’ featuring fine harmonica and piano woven in between tasty guitar leads. Parker and McCarty trade barbs with Devins on the burning 12 bar blues ‘Back Up Plan,’ each delivering a stinging solo with a distinctive voice and personality all his own. The final track on the album isn’t listed as a “bonus,” but it surely is an unexpected treat. Recorded live at the Gem Theater, the band rips through a cover of Omar and the Howlers’ roots rocker ‘Hard Times In The Land Of Plenty,’ a working man’s blues; a message that still rings true. 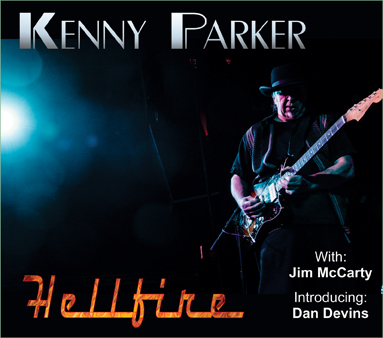 Hellfire is thought of as one of the most powerful elements in the universe and this fine album demonstrates the same power found in Kenny Parker and his scorching hot band. Parker’s blues education began with the Beatles in the early 1960s, but it wasn’t long before he discovered the roots of their music. Parker grew up in Albion, Michigan and began playing in his first band, the Esquires, at 14. He discovered Albert King and B.B. King in high school via the local record store, and he took his inspiration from them. After graduating from Eastern Michigan University in 1976 and took a job in a Cadillac factory while looking around for the right opportunities to play blues at night. He began working with a paragon of the Detroit scene, Mr. Bo (Louis Bo Collins), and later joined the Butler Twins. While Parker toured Europe with the Butler Twins, JSP founder John Stedman heard him and decided to sign him up for his own recording. The Butler Twins accompanied Parker on his debut recording “Raise The Dead,” where he was also backed by harp master Darrell Nulisch, best known for his work with Anson Funderburgh and the Rockets.